Imjingak and the Bridge of Freedom : Imjingak is a park located on the banks of the Imjin River in the city of Paju. The park has many monument regarding the Korean war. The freedom bridge is the only path that connects between the south and north around Imjin river. The 3rd Infiltration Tunnel : It is one of the 4 known tunnels build by North Korea for a surprise attack on Seoul. It was discovered in October 1978 based on information provided by a North Korean defector. Dora Observatory : It is the part of South Korea the closest to the North. 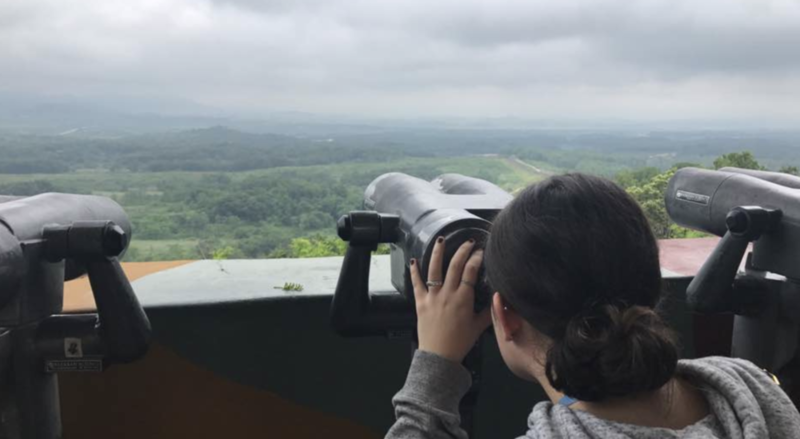 Visitors can looks across the Demilitarized Zone through binoculars from the observatory. It is possible to see the North Korean propaganda village situated in the DMZ and also as far as the city of Gaesung which is the 3rd largest city in North Korea. 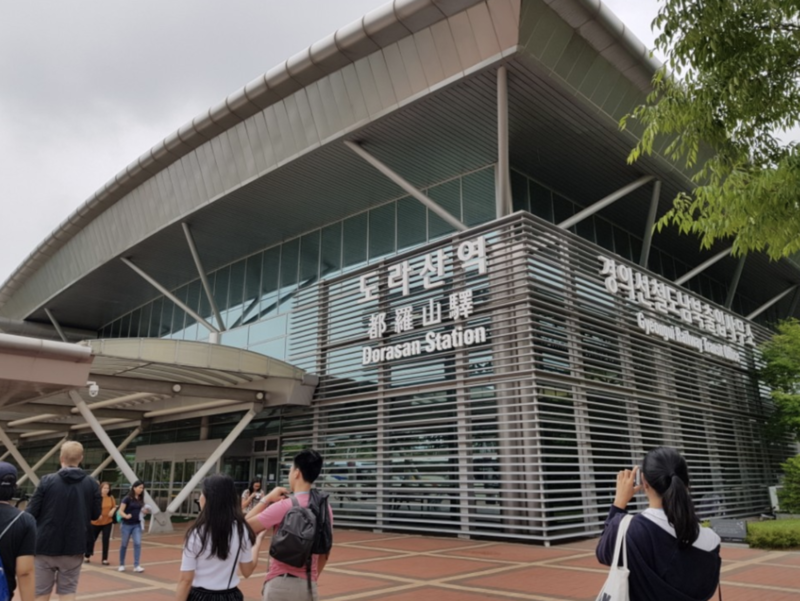 Dorasan Station : It is a railroad station situated on the Gyeongui Line, which once connected North and South Korea and has been restored. In 2000, former President of South Korea Kim Dae-jung visited to North Korea to meet Kim Jung-il and they agreed to reconnect Gyeongui Line. The construction was finished and opened in February 2002. Aissatou : It was a very interesting experience from a cultural point of view because it allowed us to become more aware of the conflict between the two Koreas. 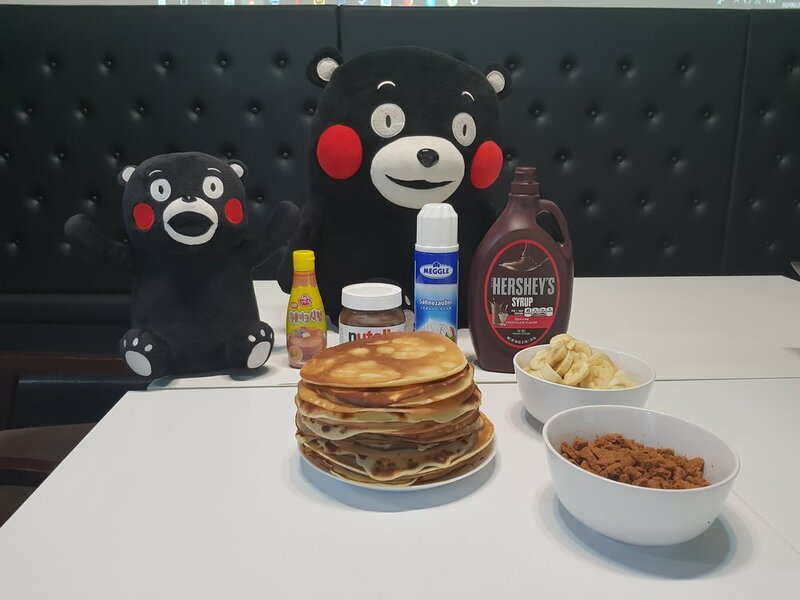 I think anyone coming to Korea should live this experience at least once. 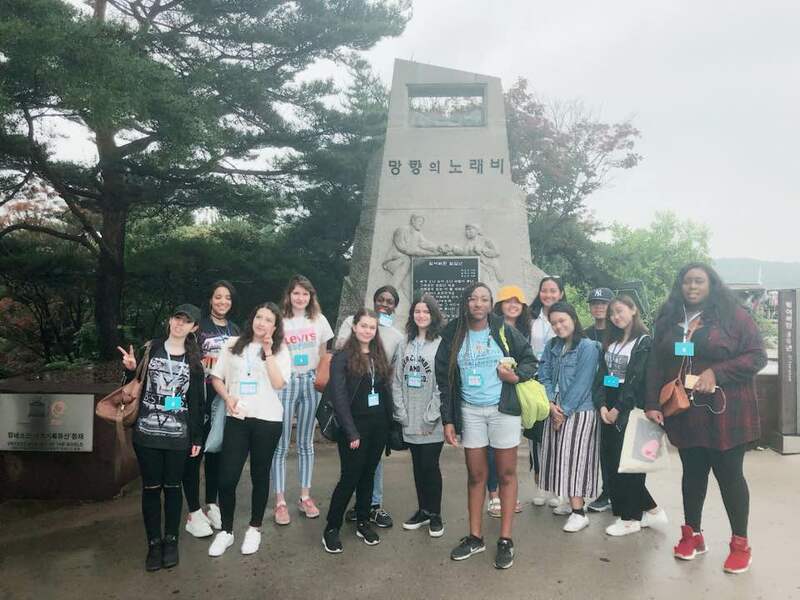 Solène : It was very captivating to visit all these places that are really important in the Korean history. I learned a lot of things about the conflict between North Korea and South Korea. Furthermore, it was really fun to go there with all the interns! All the interns of ACOPIA went to Busan from 20th May to 21 May 2018. It was a great opportunity to discover a new city and to learn more about the Korean culture. 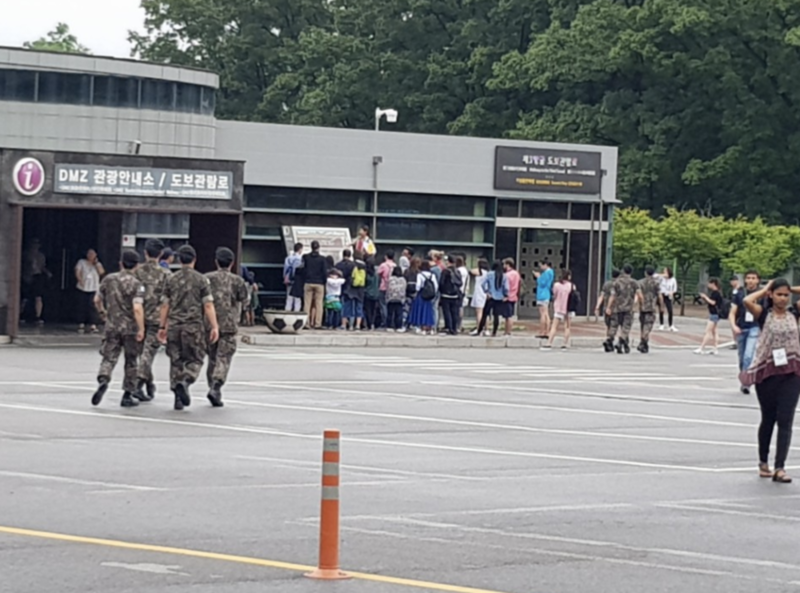 They visited the Busan Museum, the Sea Life BUSAN AQUARIUM, haeundae beach, the bay 101, gamcheon village… and tried the Korean sauna jimjilbang. The interns had the chance to wear hangbok, they were also involved in different traditional art activities. 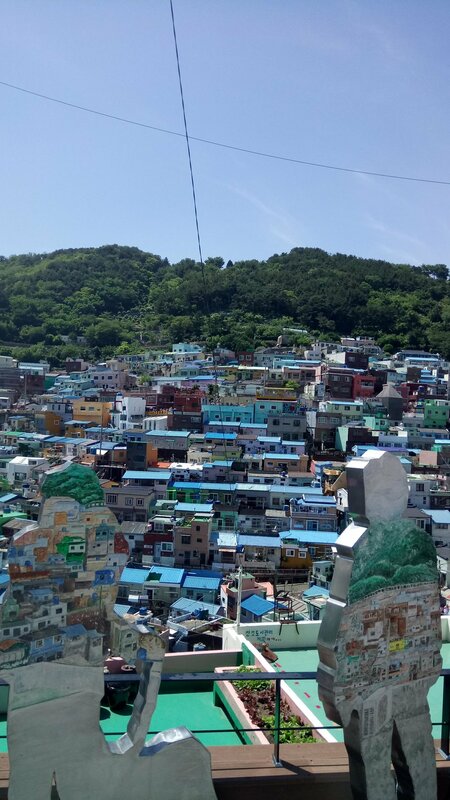 Sylvie : The trip to Busan helped me getting closer with the other interns while being able to visit another city. The museum was interesting and we could do some cultural activities like wearing an hanbok and reconstructing broken pots. The Haeundae Beach was really beautiful and we got lucky to see the sand festival, which was amazing. The 17th of June was the last day of two of our beloved interns, Neila and Aissa. We were very sad to see them go, so for this occasion we decided to do a pizza party with all of our Tuesday interns! Once every month, we organize a big meal where all interns eat together around a table. ACOPIA interns are like a big family and a big group of friends. People here are warm and loving and everyone can work together in a relaxed and fun mood. We hope we will get to see Neila and Aissa again in the future. On Tuesday 24th of July, ACOPIA interns organized a vegetarian event. The purpose of this event was to raise awareness and share views on an issue that is more and more crucial nowadays, and to promote taking good actions for the planet. The event consisted of watching a short video about health, environmental and emotional implications of vegetarianism or veganism, of debating about opinions and views on these subject areas, of a quiz about vegetarianism and finally of a vegetarian dinner cooked by interns who organized the event. During the event, participants got to exchange ideas and speak about their personal experience and feeling towards this matter. Julien: The event has been a really interesting experience, as an intern and as a vegetarian. We had a great time during the event discussing about vegetarianism & veganism. It was really enriching for everybody to have different point of views. But it was also enriching as an intern. Organizing an event was really fun and exciting. Rym: Being vegetarian is not that easy nowadays, so I never really thought about becoming vegetarian. As a meat-eater, this event made me aware of the risks that can arise on our planet by eating meat in large quantities. Not only it is very bad for our health, but also when I saw how those animals are treated, I was quite shock and disgusted. It was also really interesting to know that meat isn’t essential and that it is really simple to replace it. I really enjoyed this event because every interns and participants had the opportunity to share their point of views about vegetarianism. Also, the food was so delicious! Elika: It was a great experience to meet vegetarian and listen to their point of view. For me it was a fun night, with interesting people, nice food and new perspectives. On August 3rd, our intern organized an International Dinner Party. With this event, we want to give Korean and Foreigner the chance to meet and get an impression of each country and their languages. The highlight of our event was the international food. Each dish represents a country of one of our intern. During the event every guest had the chance to participate in our International quiz to understand each of our interns home country and to win a prize. All in all, it was a night full of laughter, interesting people, a lot of memories and hopefully new friendships. On the 23rd of August, all ACOPIA interns went to have some Bingsu together in Hongdae center, not very far from ACOPIA Café. This was for the departure of two of our beloved interns, Sylvie and Sylvain. Bingsu is a traditional Korean dessert that consists of grinding condensed iced milk into a snow ball and adding some sweet red beans and rice cakes on top, with some extra condensed milk over. Today, we were feeling adventurous so we took a tiramisu bingsu, a chocolate brownie bingsu and a melon bingsu. All three were delicious!! Yesterday, on 30th August 2018, our French interns organized a French Movie Event to share their culture! First, we cooked sweet crêpes. In France, crêpes are traditionally served on Candlemas (La Chandeleur), 2 February. A belief is that catching the crêpe with a frying pan after tossing it in the air with your right hand while holding a gold coin in your left hand would cause you to become rich that year! Then, we watched the movie called “The Chorus” (“Les Choristes” in French) while trying out the crêpes with whipped cream, bananas, maple syrup, Nutella, Speculoos (a special kind of French cookie) or just sugar! The Chorus is a wonderful movie with a touching plot and amazing soundtracks. We strongly recommend anyone to watch it!